The app was created late last year by Zain al-Abidin Tawfiq, a Saudi Arabian programmer, originally as a way for employees to provide candid feedback to their coworkers or employer. Honesty would be encouraged through anonymity, Tawfiq reasoned (especially within Arabic culture). “Sarahah” is Arabic for honesty or openness. It has been blowing up in the Middle East for several months and though it has only recently become available in English (mid-June), it was the most frequently downloaded free app in the U.S., the U.K., Australia, and Ireland last week. Here’s how it works: First, you download, install, and open the app on your mobile device. Then you enter the usual personal information (name, email address, gender) and create a username and password. 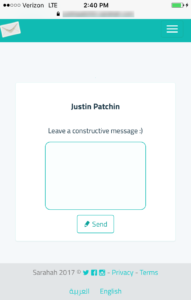 Once you agree to their Terms of Service (which are very basic at this point) you are given a specific URL (which is your username.sarahah.com) to share with others who can then send you anonymous messages. Within the Settings, you are given the option to allow non-registered users to send you a message. 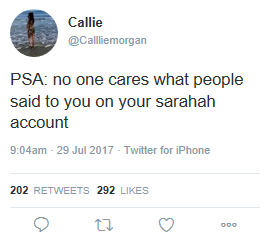 Therefore, others do not need a Sarahah profile to send you a message. All they need is the link to your page. They click on the link and are taken to a dialog box where they enter whatever text content they want. 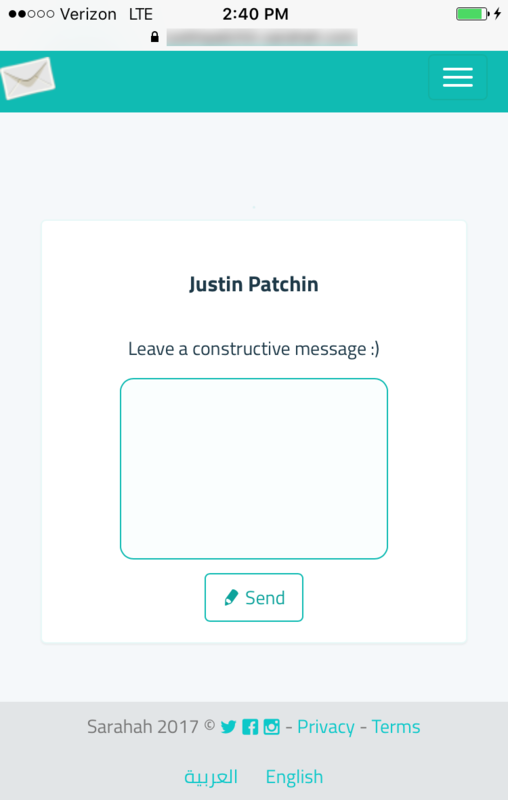 Those messages will then appear in your inbox within the Sarahah app, without identifiers. You can favorite, delete, export, or flag them, though the sender of the message wouldn’t know any of this. You are not able to reply to the messages. From reports I’ve read, most teens who use Sarahah embed their personal URL within their Snapchat photos or Instagram stories (though I believe Instagram link embedding is only currently available to verified users). This allows viewers to comment anonymously on what is seen. Of course the link can be distributed in any number of other ways: on other social media platforms, on a website or blog, or pretty much anywhere. Keep in mind, though, even if you only post your link to a select group of close confidants, one of those people could share the link more broadly, increasing the potential for abuse. Folks have already sounded the hue and cry of cyberbullying, but I think that is based more on potential, rather than an actual influx of incidents. I don’t doubt that it is being used by some to be mean (I was contacted twice last week about instances of bullying on the app), but it is impossible to know the extent of mistreatment on this brand new app. 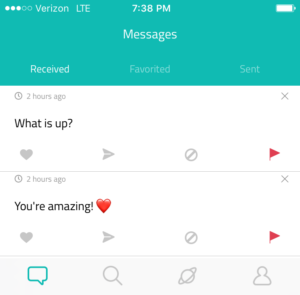 It’s also unclear whether messages are moderated in-app or if Sarahah relies on user reports to identify and address inappropriate content. The Terms of Service do not mention bullying or harassment. Many comparisons have been made to Yik Yik, Ask.fm, and many of the other popular anonymous social media platforms. Sarahah is different. With Yik Yak, users could post anonymously to a virtual public board that anyone within 1.5 miles of the location of the post could see. It was a tool for one-way, one-to-many communication that was not directed to a particular person (at least Yik Yak—now defunct—attempted to remove all references to specific individuals). And Ask.fm is like any other social media application in that a user sets up a profile, and connects and communicates with friends. Ask.fm does allow anonymous one-to-one or one-to-many question asking, and those are published to your profile when answered. 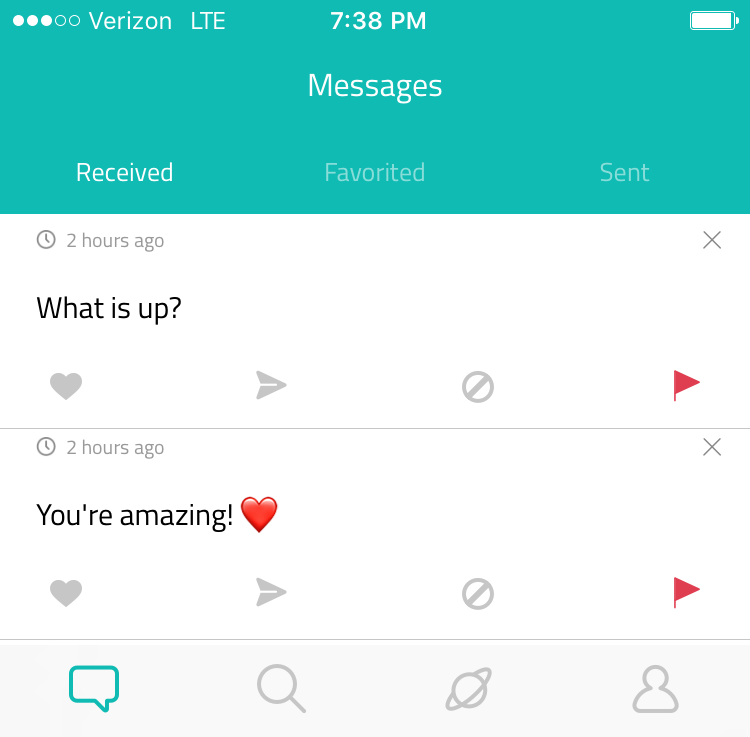 Sarahah is not really social. It doesn’t allow for dialog or any back-and-forth communication. You don’t use it to connect with–or expand–your social network. You basically invite others to send you anonymous messages (many-to-one) that you aren’t able to directly respond to. It’s hard to predict the future of this app. It certainly rose to prominence very quickly, but I’m not sure it offers much that will hold the attention of users over time. 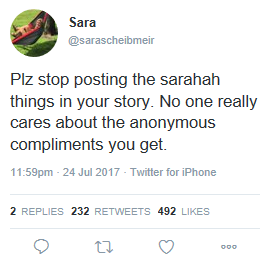 It appears that some are already tiring of seeing screenshotted Sarahah messages in their Instagram and Snapchat feeds. If I were to make a prediction it would be that this app will have a very short life cycle. Best put in for your IPO ASAP, Mr. Tawfiq. Update as of late September 2017: We still are regularly fielding inquiries from schools about threats and other issues on this app. As mentioned, the company is based in Saudi Arabia and jurisdictional issues across the world are hard to navigate. However, you can try to get help by emailing them at [email protected]. You can also tweet or DM the creator of the App for assistance. 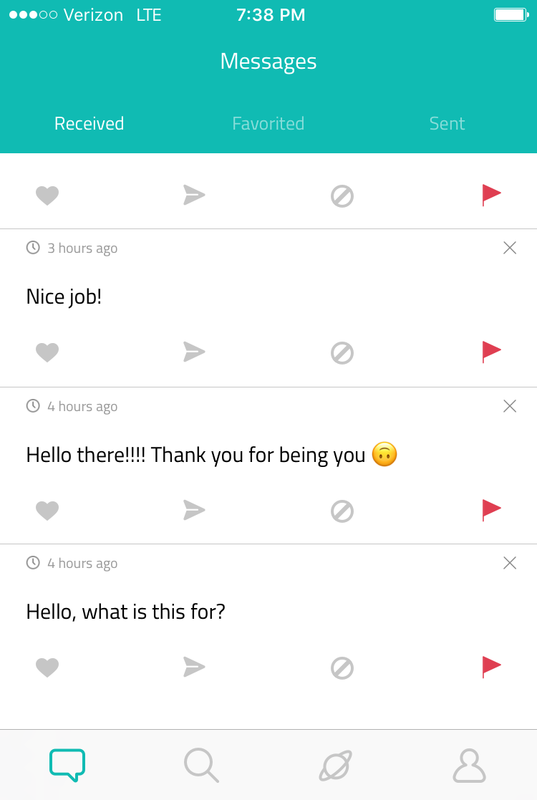 Thank you for a most helpful post on Sarahah. 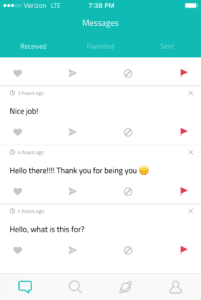 I was interviewed yesterday for a national radio program here in Canada for some insight into Sarahah. I&apos;m adding a link to this post of yours to the rough notes Google Doc I made as background material for the interview. This was interesting. It has not hit Summit, Berkeley Heights, or Mtn. as of yet…good to be on top off. Just like that series 13 ways to die. Very dangerous topic for youth… Thank you again! See you at the JETS symposium. That sarahaha app has really upset my daughter someone has threatened to come to our house threatened to cut someone&apos;s eyes out (one of daughter&apos;s friends) I told her amediatly to delete the app which she has done……the ppl who created this app are sick in the head to think it&apos;s ok to cyber bully. I am currently taking an online graduate course entitled Cyberbullying and it has opened my eyes to a number of different issues that occur online. With so many apps and websites similar to Sarahah, my concern is that people, particularity young adolescents will experience no consequences for actions of bullying, harassment, etc. Ultimately, the reason I am commenting is to find out, if a case of cyberbullying was in fact reported, could an investigation be opened that would allow IP Addressed to be used in order to track the origins of the comment? I hear you, Angela. While yes – IP addresses can be used, the difficulty is coordinating organizations (like law enforcement) to work together when online crimes involve connections across multiple countries. As you can imagine, some countries simply don&apos;t care and won&apos;t do anything even with formal requests, while others will do a little, and still others will do a lot. That said, there are some anonymous apps that have been pretty responsive when crimes have been committed in the US in terms of doing all they can to aid in an investigation and identify those involved. I wish this was standard practice everywhere. Great comment. Not all bullying is recognized. Some of it is such broad social policy that it is accepted. A university, many, tells its students there is a stigma to mental illnesses, everyone accepts it, repeats it, thinks nothing about it. It is such a common practice, it is repeated on such a scale there is almost no escape from it. I follow all those authors of "the stigma of mental illnesses" in the news. They are relentless. And far too often the results are tragic. When social policy is the bullying, there is very little one can do.